PMP visits RISE’s 26th Annual Conference in Williamsburg, Va. Comprising RISE’s Priority Issues Update Panel are (from left) RISE’s Karen Reardon, Bayer’s Frank Wong and FMC’s Jill Holihan. David Wasserman, editor of The Cook Political Report, warned RISE members to curb their governmental expectations the next four years due to the country’s polarized political parties. RISE (Responsible Industry for a Sound Environment), an organization that promotes the safe use of pesticides to control pests and invasive species that are detrimental to our health and our environment, held its 2016 conference Aug. 29 to Sept. 1 in Williamsburg, Va. Pest Management Professional Publisher and Editorial Director Marty Whitford was in attendance to document the event and report on it for our readers. Jay Vroom, president and CEO of CropLife America (CLA), shows off the red fly swatter CLA introduced 20 years ago with the passing of the Food Quality Protection Act. Nearly 200 members and guests of RISE attended the 26th annual event, whose theme was Red, White & YOU: Revolutionary Pathways. 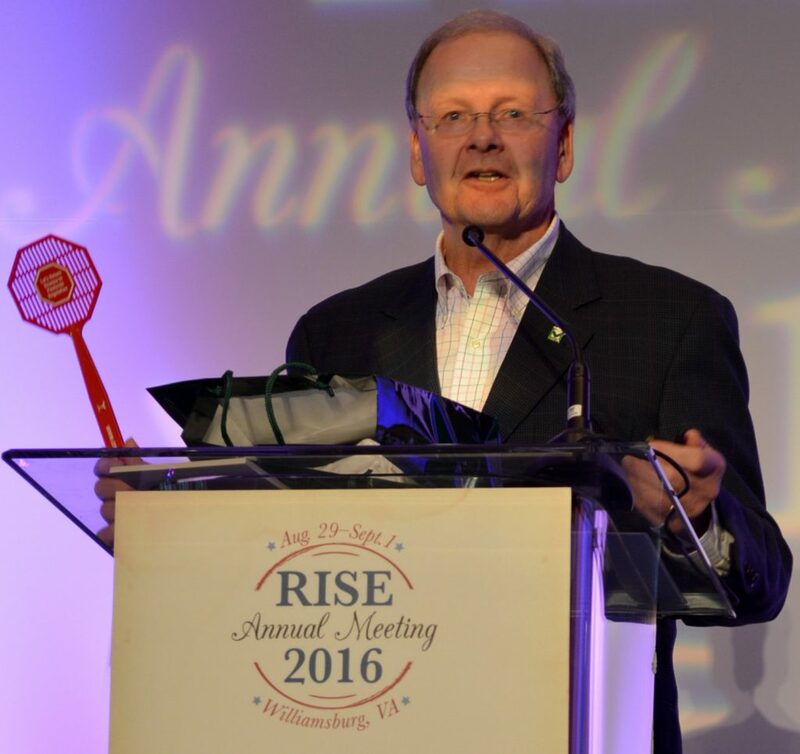 During the meeting, longtime industry professional Tom Delaney was recognized as the 2016 RISE Grassroots Excellence Award honoree. According to a release by RISE, this year’s meeting marked the second year of performance on the organization’s 5-year strategic “20/20 Vision” plan. The meeting was also the time and place for the RISE governing board to meet and appoint new members. 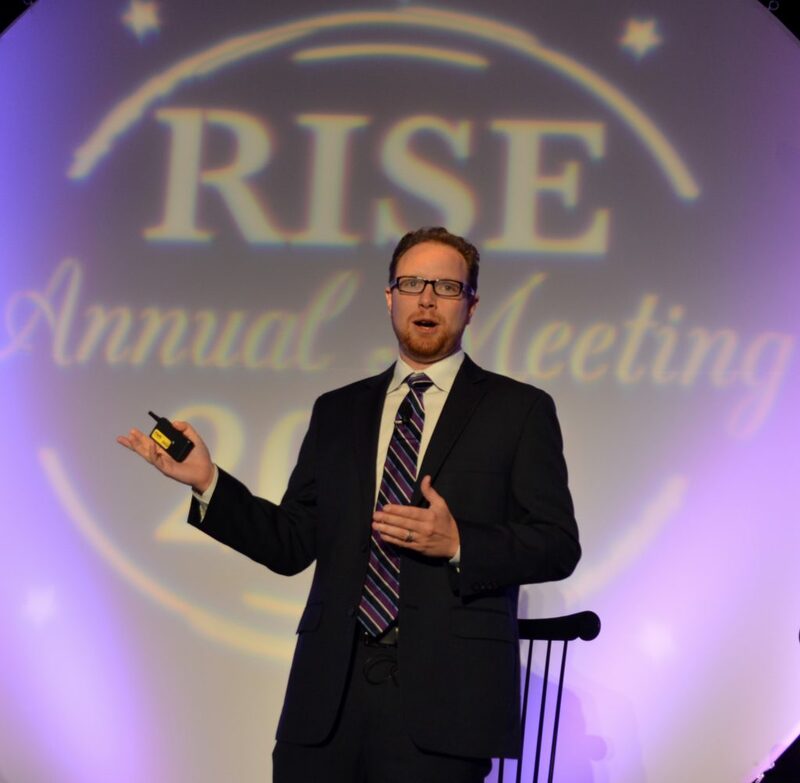 If you were unable to attend and would like to learn more about this year’s RISE event watch for Whitford’s coverage and a 5-question interview with RISE chair, BASF’s director of specialty and professional solutions, Jonathan Sweat, in PMP‘s upcoming October issue.